It has been a long time since I played a Pokémon game, that the last one I played was the Red version of the game and maybe the Yellow version. Since I last played, there have been 498 Pokémon added to the game, and that is not counting the new ones in this game. With this I have decided to get back into it. I will have no clue what I am doing at first, but let's look at what I can expect. While in combat, and if you have a special stone, some Pokémon can temporarily mega-evolve. This brings an increases to their power and can even change their type. For example Charizard in Pokémon X changes from Fire/Flying to Fire/Dragon. Yes, the Pokémon that looks most like a dragon actually is a dragon finally. Now this only can happen in combat and once you win / lose the Pokémon goes back to normal. Most Pokémon only have one mega-evolution, but there are two exceptions. Charizard and Mewtwo have different evolutions for each version of the game. To see more of the Pokémon that have mega-evolutions check out the main page here. As I said earlier, I have not played Pokémon since the original games. This makes me rather nostalgic for Charmander, Squirtle and Bulbasaur. And since the starters are Chespin (Grass), Fennekin (Fire), and Froakie (Water) I was not sure I would get a chance to play with any of the originals. Turns out that is not the case. You don't get your starters from Professor Sycamore. The Professor gives you the same choice we had in Pokémon Red and Blue. Meaning here we choose Squirtle, Bulbasaur, or Charmander. Then most likely your nemesis in the game will take the paper to your rock. Something else that has been updated is the battle system. Now a camera flys around the battlefield making the combat look more engaging. You get a better feel for how the Pokémon are attacking each other and how their attacks look. There are also new types of battles. Horde battles send one of your Pokémon against a group of another type. Then there are air battles where only a flying type can qualify (makes sense). Want to go try for that badge, but don't feel your Pokémon are ready for the gym leader? Now you can start super training. This is where you can raise your Pokémon's level without fighting other trainers / wild Pokémon. Here you actually train your Pokémon yourself to level them up. What sort of effect will this have on overall gameplay and multiplayer? Only time will tell. This feature will not be live until December, but it allows you to store up to 3000 Pokémon in exchange for a yearly fee. You can even bring them over from Pokémon Black, White, Black 2, and White 2. This makes life far easier for the obsessive collector. 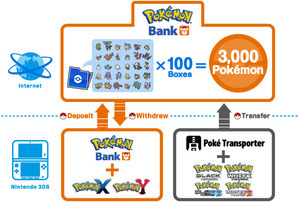 Now if you want to trade Pokémon between X and Y games you don't need two systems. Just upload it to the bank with one game inserted, swap games, then download. Another advantage is that should the worst happen and your game gets lost / destroyed the Pokémon stored in the bank are safe. I am sure there is more I could write here, such as discussing things on the new legendary Pokémon Xerneas (Pokémon X) and Yvelta (Pokémon Y) or about the new Fairy type of Pokémon, but sometimes there has to be some mystery left to a new game. The game is released world wide on October 12, so it is not like you have to wait long to find out. My advice at this point, assuming you are getting it, is to get it as soon as possible. At launch Nintendo will be distributing a Torchic holding a Blazikenite stone. Without it you cannot get Blaziken to mega-evolve, and you can only get it through the Nintendo Network. He will also have a hidden ability called speed boost that will increase a Pokémon's speed at the end of every turn. Last thing, if you happen to be lucky enough to live in New York. You can attend a special event that will include costumes, picture opportunities, and chances to play the game. Once midnight hits then you can get your copy at Nintendo World itself which will be open all night to accomodate fans.